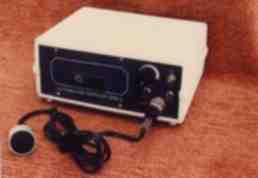 - EEC'c Foetal Monitor has high sensitivity and power output - The Ultrasound Doppler frequency is 2MHz. - It is useful for detection of foetal sounds from 10 weeks onwards ; and can determine foetal distress, intrauterine death and multiple pregnancies. The Major Doppler Foetal monitor is ideal for obstretic, gynaecology departments of Hospitals/Maternity Nursing homes. The Foetal monitor works on the principle of Doppler effect. Low intensity ultrasound frequency is beamed into the body from the small transducer probe. The beam is reflected back with slight change in frequency due to movement of foetal heart, blood particles or other moving organs. The reflected signal is received by the instrument, amplified and processed electronically to produce audible beeps on the built-in speaker or external earphone. Audio output: Maximum 1000 milliwatts, adjustable by means of volume control. Size/Weight :21 x 9 x 17 cms / 2 Kgs.